Each year, millions of Americans face the challenges of living with a severe mental illness. The facts are staggering: 2.6 million are bipolar, 16 million live with major depression, and 42 million have anxiety disorders. When a young Olean mother ended her own life after struggling for 10 years with bipolar disorder and depression, her mother, Barb Sweitzer, who works with the YMCA of the USA, knew something had to be done to address this disease. While Barb has been working for two years to fund “Swizzy’s Cause” for a behavioral health care coordinator, the Rehabilitation Foundation stepped in to expedite the program by funding the position in the interim. “It’s a perfect example of community agencies coming together to care for community and reach a greater impact,” Barb said. 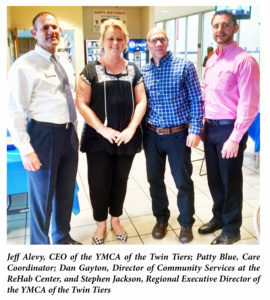 ”Swizzy’s Cause” blended the expertise of the ReHab Center with the social and exercise activities at the YMCA and hired Patty Blue in June. “Through this position, both the Agency and the YMCA, are meeting people where they are,” Mari said. “Behavioral health is very complicated. We need to make it more accessible to people so they feel comfortable reaching for what they need, right where they are, rather than in a sterile mental health clinic. “This joint effort combines the ReHab Center’s expertise with the friendly atmosphere of the Y to offer people in the community a welcoming, non-judgmental person to talk to,” Daniel Gayton, Director of Service Coordination at the ReHab Center, said. Patty will provide mental health support to members, and take notice if someone stops showing up and reach out to that person. “Patty can make referrals. She’s watching the whole person, incorporating the Y’s cultural wellness into the whole person,” Dan said. With more than 20 years of experience in mental and behavioral health, Patty has the expertise to support people. On her first day, Patty had five referrals for people who were either feeling depressed or facing difficult life challenges. “This position really brings together the Y and the ReHab Center,” Jeff Alevy, Regional CEO of the YMCA, said at the open house. Without precedent, this joint decision to bring onboard a professional with a behavioral health background is a unique step in supportive community health.